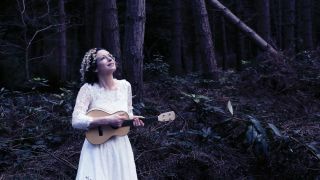 Kate Rusby is the embodiment of the folk tradition that is so much a part of Yorkshire where she was born and lives with her husband and family. From there, Kate records in her own studio not far from her home and takes her band out on tour to bring her music to her enthusiastic and growing audience. The ethereal images on her new album Angels & Men, showing Kate as an angelic figure, complete with an impressive set of wings, are utterly at odds with the entirely human and down-to-earth musician who chats with such enthusiasm about her life and music in her living room at home. Kate begins by explaining how her technique for songwriting has adapted since the birth of her two children. “I used to write all the time before I had children. Then it was easy, if an idea came to me, I would find an instrument and play for a bit and a song would come, or not, as it was, and then I would work on whatever came along over the next few days. 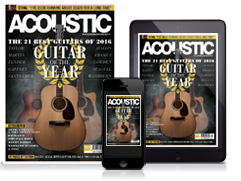 Along with the writing process, and its changes to adapt to family life, it’s inevitable that the acoustic guitar playing style of a professional musician like Kate will adapt through time, as she describes. “When I first started playing the guitar, I started with a massive Guild model, it was red, and it was given to the family by Willy Russell the playwright - his wife was at university with my mum so they have been family friends for as long as I can remember. Willy always had a lot of guitars around the house and he loaned this Guild to my dad, so it was the first guitar I learned to play on. “My dad taught me a few chords on this guitar and I used to sit and play songs in my bedroom. It was too big for me really, I could barely get my arm around it. But I knew lots of songs because my parents taught us loads of songs, I worked out the chords for those and then started working on my own chords for my own songs. “Then I got a gorgeous Gibson acoustic that a friend of my dad brought back from America when he was touring over there. He saw this guitar and rang my dad and said it would be perfect for me because I was so small. So I got that and played with it for a while, but it went missing from a hotel lock-up in London. There were a few bands staying there, so it may have been picked up by mistake, but whoever got it never tried to get it back to me when they realised it wasn’t theirs. The songs on Kate’s latest album contain her usual mix of traditional songs and her own compositions, but they are all full of the particular musical atmosphere that she manages to create. Anyone who has recorded in a studio knows that the sterile atmosphere can be less than conducive to intimate emotions being conveyed to the listener. Kate fully appreciates the joy of owning her own studio where she is able to take time to perfect the songs and use its ambience to create the presence that defines her appeal. “We are lucky to have our own studio,” Kate agrees. “One of the first things we did with the money from touring was to form a record label. My dad is in charge of that and we started buying studio gear and we bought an old farmhouse not too far away, maybe 15 minutes from home in the car. It’s far enough to be ‘work’, which means I can leave it behind and have a separate home life without my career taking over everything, but it’s close enough to nip over with a good idea. Although folk musicians tend to follow the patterns and structures of their songs from their albums out onto the stage during tours, there is still room for some changes, which occur organically in Kate’s experience. “It’s an interesting point. Sometimes when you work in the studio you may be constrained by time, the time you have the musicians available for instance. But when you play the songs on the road, little bits change and evolve in the way they work, so you can stretch them out, or just change them. Another aspect of the recording process where Kate takes particular care is working out her vocals. When asked for tips, Rusby offers them with the same enthusiasm she brings to her shows. “In terms of playing, you must listen to as many people as you can, and really study how they sound, and get those sounds. Is it tuning, or technical playing? You may not even want to duplicate what you are hearing, but it will feed into your own technique and you will learn something you can bring to your own playing. Angels & Men is out now.